THIS IS NOT A NOVEL, by David Markson. Counterpoint, Washington, D.C. 190 pages. $15. 2001. 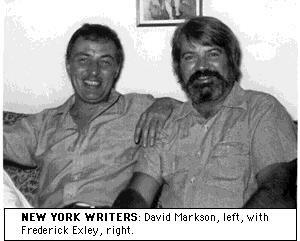 While he may be the most interesting writer working in America today, novelist David Markson finds himself known nearly as much for his friendships with other authors as he does for his own work. He figures more or less prominently in the biographies of Dylan Thomas, Malcolm Lowry, Frederick Exley and Jack Kerouac, and has been a fixture on the New York literary scene for more than 40 years. The situation speaks volumes about the state of American letters, in which new and experimental works find publication--if at all--only by small, independent houses that often have a hard time paying their authors, much less spending anything on the promotion of their books. Meanwhile, the latest mediocrity churned out by Stephen King, Scott Turow or Anne Rice climbs the bestseller lists and makes millions for the corporate bean counters who now largely control the publishing industry. But in a lot of ways, Markson resembles less an American author than a European one. Ann Beattie has compared him to Samuel Beckett, and David Foster Wallace once called him the American James Joyce. A writer of what newspaper critics like to call "minor masterpieces," Markson lives a solitary life in Greenwich Village, his primary contact with the outside world being the voluminous correspondence he keeps up and, occasionally, a book. In France they'd probably give him a medal but, of course, this ain't France. Markson's latest, This Is Not A Novel, continues on the path he set out on in 1988 with Wittgenstein's Mistress and developed more fully in Reader's Block (1996). His aim has been nothing less than to dispense completely with the conventions of the modern novel. He has discarded plot, characters and action like a soldier dropping heavy equipment by the wayside on the long march home. What is left is a sort of epic poem in which the author attempts to find some truth about the nature of death, fame, literature and art. Seemingly unconnected facts and observations are strung together until patterns emerge and the whole becomes greater than the sum of its parts. Markson's command of the language and his encyclopedic knowledge of diverse subjects ranging from Renaissance painting to baseball serve him well on this quest. While he tells us at the beginning he is "pretty much tempted to quit writing," he thankfully does not do so, and the sometimes tragic, often comic and always ironic results make for a fascinating read. Joe DiMaggio, Tacitus, Somerset Maughm, Conan Doyle, St. Teresa of Lisieux and Luciano Pavarotti--along with hundreds of others--appear side by side on the pages as Markson attempts to glean some fragmentary insight on the human condition from their lives. Taken with Reader's Block and Wittgenstein's Mistress, This Is Not A Novel represents far more than a minor masterpiece. Together, they constitute a complete rethinking of what is meant by "a novel," and indeed, what is meant by "fiction." This radical assault on convention--no less daring than the painting of Jackson Pollock or the music of John Cage--succeeds through the sheer force of its author's will. "If you can do it, it ain't bragging," Dizzy Dean once said. Markson's done it, and he can take his bow without a trace of false modesty.